I moved to Minnesota in 2016 from Maine. I knew about Highpoint prior to that and was excited to become part of such an active print community. After resettling my studio practice, I was awarded a 2017/2018 Jerome Emerging Printmaker Residency at Highpoint which reinvigorated my work and has given me momentum ever since. Originally from West Virginia (with some serious Wisconsin family-roots! ), I first discovered printmaking while attending the Cleveland Institute of Art. Even though print wasn't my exclusive focus then, I later returned to school to receive my MFA in printmaking from the University of Delaware in 2013. 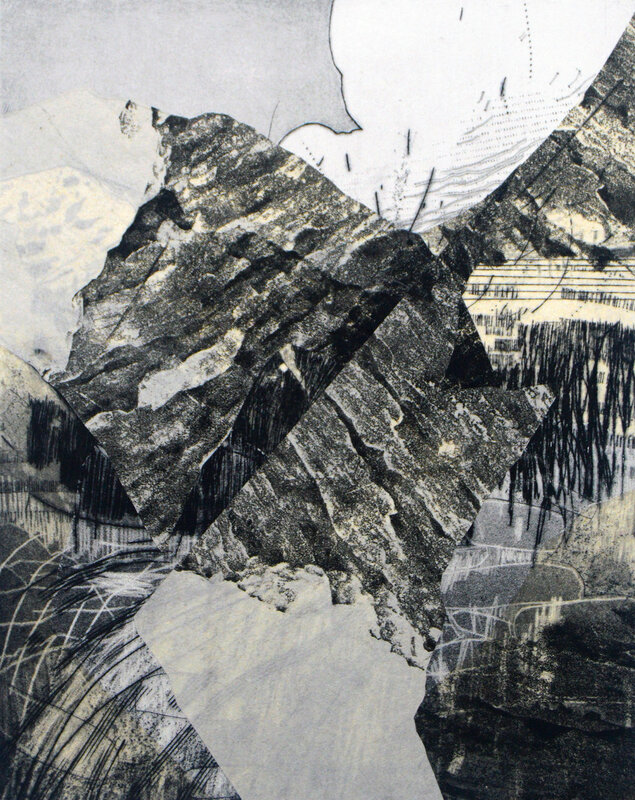 For about the last ten years, my prints have been based on representing the pace of change to places I have a deep connection to: from the mountain-top-removal occurring in West Virginia, to retreating glaciers in Alaska, to climbing mountains and standing in trout streams. I view the landscape as a reservoir of mark-making from the geological to the man-made, and I try to echo the tension between these marks in my images using a mix of both representation and abstractions. I mostly work with intaglio, collograph, and relief techniques. The physicality of making these types of plates feels reminiscent to the way history is embedded in the landscape. I try to find parallels between this and the process of accumulating a history of mark-making into a plate's surface to create a print. I feel fortunate to have arrived at Highpoint where I have found a community of supportive co-op and staff members that continue to push printmaking as a means of expression. I'm always discovering something new within my own work being in such a positive studio environment. I've moved around a lot in the past, but it feels exceptionally good to be producing work in the co-op knowing I'll have many additional productive years to come here. As a long-time neighborhood resident, I became aware of Highpoint through my daughter’s involvement during high school. She took part in the teen Access/Print program in 2010 and was later an Education Intern one summer when she was home from college. I studied fine art photography along with design as an undergraduate. Since then, I have dabbled in the book arts, letterpress, and alternative photo processes, mostly through continuing education classes. I saw an opportunity in the newsletter and volunteered as an Education intern myself last year, following in my daughter’s footsteps. I was hooked and began exploring the amazing world of printmaking at Highpoint in the co-op. My work reflects all my interests and the world around me, both natural and man-made. Recently, I’ve been experimenting with the technically demanding process of polymergravure, resulting in images like In My Soup. This is an intaglio print made from a plate produced as a photogram. I’m intrigued by how the physical manipulation of the ink adds another dimension to this early photo process. I’m so grateful for the wonderful people and stimulating environment I’ve found at Highpoint and now enjoy mentoring the teens in the Access/Print program while continuing to learn. What an incredible place! I have always been drawn to screenprinting. Creating an edition has always been appealing to me, as I want to create beautiful art that many people can enjoy. With this technique, there is a direct correlation between making the stencil and the finished print. Make a mark, print, repeat, and eventually (hopefully) you will have executed what you imagined in your mind. Recently, I’ve been working on a series of landscapes. I’ve been learning how to put years of painting skills into service by painting the imagery I use to make my screens. Starting with basic blocks of color, I build from there, adding layers of marks and reacting to each previous color. The image develops organically with each run through the press. It’s not exactly an efficient way to produce a print, but I love the process of rendering, color by color, that vision onto paper. Highpoint is a great place for me to work. The facilities and equipment are excellent and the community is wonderful. While waiting for a screen to dry, I find inspiration in the gallery or discuss techniques and motivations with the other members. As a result, I’ve found myself more focused and encouraged to continue printing. A native Minnesotan, I fell in love with intaglio printmaking while studying under Leo Lasansky at Hamline University and his father, Mauricio Lasansky at the University of Iowa. Although it was challenging, I maintained my art practice (painting, drawing, collage) while pursuing a medical device marketing career and raising a family. For support I was a long-term member of Women’s Caucus for Art and WARM (Women’s Art Resources). It was always my dream be a coop-member of Highpoint Center for Printmaking - I went to many free ink days through the years. After a long absence I returned to intaglio printmaking because of the detail and richness you can achieve. To get started I took a one-week intensive at Highpoint with master printer Gregory Burnet. Highpoint is a great place to learn; from other coop members, watching the professional shop work, getting technical advice from staff and the educational programs they offer. To deepen and broaden my skills, I have taken several workshops and had a solo exhibition in the Threshold Gallery, a valuable resource offered to co-op members. Recently, my piece Wood Nymph (pictured) was recently accepted into the Stand Out Prints International Exhibition. In my work I strive to make a psychological, emotional impact and use multiple techniques for a complex and layered affect. The space at Highpoint, the organization and equipment is world class. It is a joy to “come to work”. I have lived in the Midwest my entire life and have always appreciated our open spaces- cornfields, prairies, the huge starry night sky. However until recently, I did not realize how important the Midwestern landscape is to my art practice and how I yearn for its expansiveness to find space and stillness within myself. Born and raised in Minnesota, I grew up on a farm two hours southwest of the twin cities near Springfield (there is one in every state). Although I drew as soon as I could hold a pencil, I was equally interested in economic theories and business models. In 2014 I received my undergraduate degree in business administration with a focus on entrepreneurship from the University of St Thomas. I took my first printmaking classes as an undergraduate in graphic design. I loved the physical process of intaglio printmaking, and the way that etching and printing a plate transformed and contributed to an image. I was excited when I discovered the co-op at Highpoint: I could continue to explore the medium in a well-equipped studio, and also get to know a supportive community of artists, experts and instructors. When I first began working at Highpoint, the rule I set for myself was to avoid anything that felt conservative. After four years in an undergraduate program that was centered on traditional figurative painting and drawing, I was ready for a change. Underlying this change was a desire to replace the primacy of skilled mark making and virtuosity that occupies the attention of many artists with a more process-driven approach. My best work has a sense of being built or engineered, so naturally I have become invested in designing things digitally using a combination of Adobe Illustrator and Photoshop. I first became interested in sculpture some 25 years ago. After a time, I became frustrated with the lengthy clay to wax to bronze process. Consequently, I switched to woodcarving, a process in which I’m fully involved that moves along at a faster pace. During this time, I also became interested in old film cameras, negatives, and working in a darkroom. My studio practice is an important contrast to my contemporary life, in which my daily rhythm is continuously interrupted by the immediate demands of digital interactions. When managing tasks on my computer or phone, my movements are tracked, quantified, and monetized within predefined symbols and layouts. My current body of work explores storytelling and illustration through a series of charming characters. It features anthropomorphic critters native to Minnesota and speaks to my love of the outdoors. Through the use of a children’s book aesthetic, I aim to capture a sense of nostalgia and innocence. These endearing scenes attest to my years of working with youth and include a humorous touch. My path to Highpoint began somewhat unconventionally, with my graduation from Perpich Arts High School in the spring of 2015. Rather than attend college right out of the gate, I decided to take a year off to give myself the opportunity to try something outside of the traditional educational setting, and to better inform what I would do with my eventual college experience. I spent the year working at the Walker Art Center and interning in their education department, and a coworkers mention of Highpoint’s internship program led me to working as an education intern from the fall of 2015 to the spring of 2016. I had the opportunity not only to work with an amazing and diverse array of students, but was also afforded access to Highpoint’s co-op studio. I am a Minneapolis native and I have been drawing since I was a child. My career choice at that time was to be a commercial artist, I had no idea what they did, but I wanted to be one! Most of my childhood was spent within a mile of the current Highpoint location and joining Highpoint has been a return to that starting point. I began college pursuing a degree in architecture at the University of Minnesota. I discovered I was not meant to be an architect, and switched to Studio Arts as my major. My practice is governed less by a given theme than by the pursuit of certain tendencies and preoccupations. There is a tendency towards, even an embracing of, inefficiency, of allowing time and human effort to make their way into the work, a desire to approach perfection by imperfect means. There is a tendency toward focusing on what Soichi Ida called “what’s happening in the between,” on interstices and byproducts of process. I am fascinated by gaps, by the dotted line, the incomplete square, not as exercises which can be overcome by the mind, but as means of resisting closure. It’s difficult to describe my attraction to prints and printmaking. Maybe it’s the mysterious, inverted nature of the whole thing, or the focused hours of experimentation, the sidetracks, the dead ends…the sudden revelations. Over the past year, I have been experimenting with ways to incorporate printmaking into my work as a sculptor. I am attracted to relief printing not so much as an end in itself but as a means to manipulate paper in a structural manner that guides and supports an expanded goal. Originally based upon close-ups of skin, these pieces have evolved in several directions that include expanded references to the body and other cellular structures as well as occasional allusions to landscape. I've been a member of the Highpoint print co-op nearly my entire time in Minneapolis. I was raised in Michigan so I am accustomed to the cold and while I’m happy about all the lakes, I wish they were bigger. Born and raised in Minneapolis, art was a large part of my upbringing, but it wasn't until attending The California College of Art that I committed my full attention to it. I called the Bay area home and my identity as an artist had been linked to that city. When I moved back to Minneapolis, I didn’t know any artists and lost that sense of community, that is until I found highpoint. My art is a lot like my hiccups. I’m not sure why they happen and I cannot always predict what they will sound like. They’re always at least a little bit funny, but sometimes they can be uncomfortable. Like my art, I have faith that my hiccups are trying to tell me something, “you use way too much hot-sauce” or “holding your breath won’t help you calm down”. As their host I am both tickled and plagued. My images are simple and speak to my love of illustration and story. These odd and often humorous scenes, though quaint, are echoes of anxieties, much larger than the image, but somehow just as simple.